A car collided with a tree early Sunday in San Jose, killing the driver (Sept. 18, 2016). 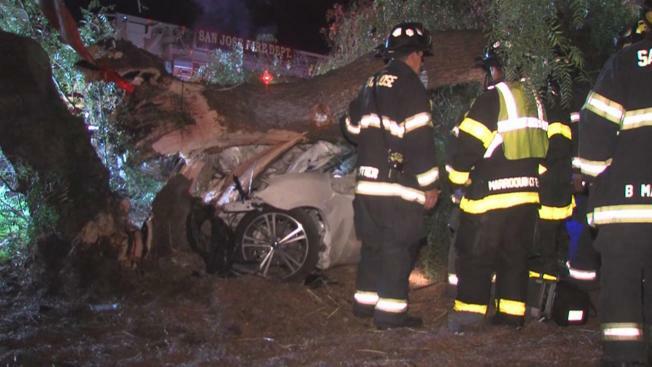 One man died after his vehicle collided with a tree early Sunday in San Jose. The solo-vehicle collision happened just before 4:30 a.m. when the driver, who eyewitnesses say was driving at high rate of speed, veered from U.S Highway 101 before crashing into a tree near Blossom Hill Road, according to Sgt. Daniel Hill of the California Highway Patrol's San Jose division. Hill added that the tree came down on top of the white coupe after the crash. The victim, who was later identified as 21-year-old Watsonville resident Edgar Lopez Ayala, was pronounced dead at the scene, Hill said.